A pupusa is a dish originating from El Salvador, with a thick corn tortilla surrounding gooey cheese, meat, beans and squash. All this goodness is topped with a cabbage slaw, thin salsa and crema. We added some plantains and sausage to seal the deal. The result was sweet, salty, savory, chewy and crispy – a taste and texture explosion, if you will. The diverse mix of flavors in the pupusa may be a bit of an acquired taste – my eating buddy wasn’t as crazy about it as I was. 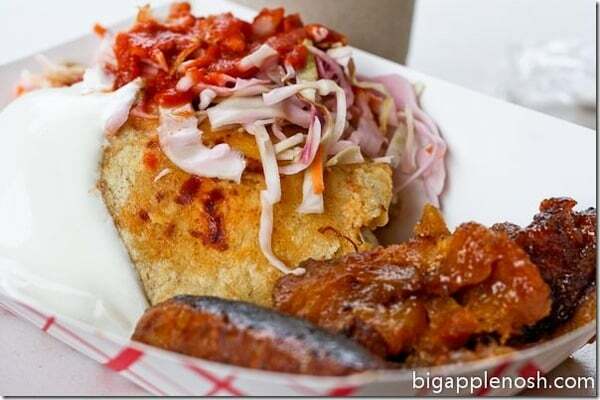 However, if you’re ever at the Brooklyn Flea or the Red Hook Ball Fields, give the pupusas a try! An interesting flavor combination worth a try! Check out the Flea site for weekly schedules! Have you tried pupusas before? omfg that looks so good. Every single time I read your blog I get so hungry. even the word pupusa is so appetizing, isn't it? it looks great! I go to these guys all of the time!! I love their pupusas. that looks so good! I love crunchy and gooey textures together. That looks alot better than the one I had at the Oakland Food Fest here in CA. I didn't like it either but will give it a second chance given the right vendor. I've had them at the Brooklyn flea – 3 apples for me too! That looks delicious! I need to find someone who makes it here in the SF bay area. Again with the whole NY/Dallas thing. I'd love to get my hands on some of these, but while Dallas is choc full of Tex Mex, it's a little more difficult to find good food from other South American countries. All that to say, I'm jealous. I remember pepusas from my trips to El Salvador, but this looks so much better!! I love the Brooklyn flea, I try to eat something different everytime I go, I haven;t had these yet.